The use of live animals as part of the continuing training of veterinarians still persists in 2018, while other educational tools and alternative methods exist, and have proven to be effective. We write to the veterinary facility to demand that these courses be stopped. One Voice has purchased a program on anaesthesia, dentistry and rabbit surgery given to practicing veterinarians. Imagine in the reality of these animals serving only as course material, it makes you shudder. We are revolted. The instructors demonstrate to their audience using a live rabbit, while digital video, multimedia software or virtual reality would be at least as effective, if not more so. These alternative formats make it possible to see the manipulation much more clearly, offer the possibility to enlarge, to make stills and to watch several times. So, we deliberately anesthetize these rabbits and make them endure a whole day of manhandling! One can easily feel their pain and stress. To make an anaesthetic last all day long it is certainly necessary to "sleep" them several times... These small animals with long ears and so soft, could suffer this on many occasions, when the effects of these analgesics diminish. Especially during the breaks that the humans will have taken from the coffee machine in the middle of the morning, and then again to be satisfied in the middle of the day. During this time the rabbits will remain on the operating table. The program for the day is organized for the humans, yet it is the beginning of the ordeal for these unfortunate rabbits. 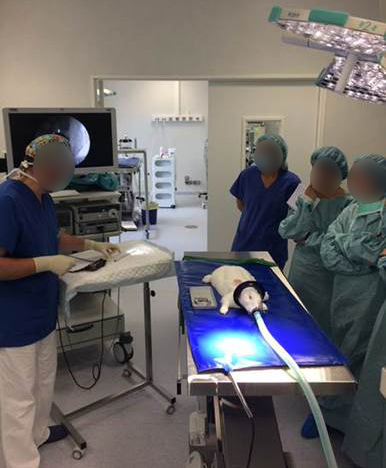 9h - 11h: Each of the teachers will subject the "rabbit-material" to different types of anaesthetic. There are at least two rabbits to show these methods of anesthetization by intravenous injection, and by the volatile route (by inhalation of a gas). A catheter is placed inside each of these small beings for this demonstration but especially to be able to inject the analgesics through the day. Similarly, several methods of orotracheal intubation are used, and therefore so many rabbits will see a plastic tube inserted through their mouth to the trachea and then far down into their throats. It is likely that the clinical actions are repeated several times so that the trainees can see the manipulation process and how to perform this from all angles. At what moment would one consider the impact of all of this of them, certainly "asleep" but also still living, never? 11h30-12h30: After the break, the second part of the morning is devoted to the sterilization of rabbits and the castration of rabbits. The instructors thus remove the reproductive organs of the animals (testicles of males and ovaries and uterus of females). Since several irreversible surgical techniques are taught, one animal is required for each intervention (i.e. at least four per trainer)! The animals will stay in the classroom while veterinary participants and their instructors go to lunch, and will see them return at 1:30 pm to then proceed to use them for dental extractions! At the end of the day, the rabbits are all killed. All of them, precisely because their death is made unavoidable after the trauma suffered during the practical courses. Thus, ends their life and their torment, by the liquid flowing through them via the catheter. According to our scientific consultants, this procedure is by no means necessary for the correct learning of these skills! We have written to the veterinary establishment where these sessions are organized to demand their immediate ban. This type of training organized with laboratories should no longer exist, we are working on it. Toujours la même chose. Le lapin ne va pas s'exprimer ou porter plainte, donc on se permet n'importe quoi. Après tout ce n'est qu'un objet, pas plus de valeur qu'un caillou. Y'a-t-il une pétition à signer? bonjour, il n'y a pas de pétition spécifique pour ce sujet, nous vous proposons de signer la pétition pour l'élevage de Mézilles qui rejoint la campagne contre l'expérimentation animale : https://one-voice.fr/fr/petitions/mezilles.html. Un grand merci et bonne fin de journée.